Lighting-Gallery-net - Fluorescent - T-12 and larger/Craigslist haul. Lustras and all. Craigslist haul. Lustras and all. The other day I said in a comment that I never find cool fluorescent lamps on craigslist. Well, I proved myself wrong. That GE .. Never seen one with that etch before deff a cool find there! @veryhighonoutput, Lustra was a small independent lighting company, later owned by Philips. The Lustra lamps here were made at an old Philips-Norelco factory in Lynn, MA. @everyone, the GE 28w Optimiser lamps require special ballasts. These I got are Lite White. Way cool find! I don't have a clue as to why Lustra had a "out" date space. I think the one with the darkened solid letters is from the 70's. I remember a drug store on the Vineyard ( where I spent part of my summers) had them in four lamp half pipers. All preheat and all were daylights. That darkened letter one is from 1977-81. The IN and OUT date recording feature was only found on those made before 1977. 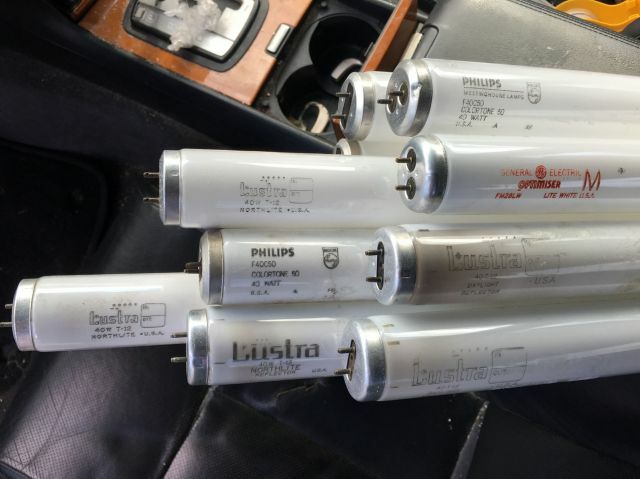 A GE red etch Lite White, a Philips-Westinghouse, and a bunch of Lustras! This thing seriously needs a drool emoticon. Sweet haul! wow! something new to me about GE Optimiser! Lustra are beauty and Philips colortone 50! I agree with icefoglights about need drool emoticon ha! Great finds! The OptiMiser lamps...are they designed for ballasts that cut the cathode heating/would be 34w on a "normal" ballast? Yep, Optimiser lamps are only for electromagnetic ballasts with cathode heat cutout. Oh, update: The Lustra with the bold logo is dead! All the others work good. Will upload pics of the two different Lustras tomorrow. Will they be OK on non-cahtode-heat-cutout, though? Actually haven't tried these. They look brand new. I'm sure they'll work. Hey Dave---I just left a huge box FULL of those red etch, some with gold end caps, FM 28 Optimiser lamps to die in the area way out back behind my house a few years ago! Still there I surmise in a now rotted apart box, about 40-50 of 'em. All are at EOL though. I hear the gold based ones are rare, must be because only like 3-5 in the box were gold ended. I do have a few specimens that work, I never thought they were anything special, have a few ballasts for these oddballs too. And they DO work FINE on regular preheat ballasts--especially single lamp ones. There were several in preheat single lamp strips in the basement of the church where John Harnden, the GE engineer from the Schenectady plant goes to church, he tried the FM 28's on preheat and they work fine, the ballast thinks that are F30T8 lamps I guess! and they have been in those fixtures for years and work fine. The FM 28 ballast will operate F34, F35 and F40 lamps too. They are an oddball hybrid magnetic/electronic piece of crap typical of most GE stuff--screwed up and not practical. I blew one in a fixture in my basement I installed it in in the early '90's, and heard these tend to blow up, and I mean it blew--like most GE junk RS ballasts, it arced through the fixture burning a big hole in it and the sparks were as much as using out cutting torch on heavy steel! This was a brand new, unused ballast I paid over 50 bucks for and got 2. I tried to return it, and the guy at the electrical store said GE knows the issues and stopped issuing returns. Typical of Greedy Extortionists--wonder how many buildings ended up piles of ashes from these hunks of crap? I lost 50 bucks, and just hacked the wires off for copper and scrapped it for copper bearing. Everybody wonders why the FM28 GE Optimizers disappeared--this is why--that and on RS they burned out faster than a 1938 MAZDA! They seem to only work decent and last on 1 lamp preheat ballasts. SO--I have over 50 of these lamps, sitting way out back rotting into the dirt, where they rightfully belong. i will keep the working lamps (only a few) as a testament to another useless GE product---that failed, like LED's will nowadays. The Lustras are delicious, even the Phileeps-Westy is a nice lamp. the FM28 was an exciting lam for me when it came out, and the lamps and ballasts are both garbage, only for collecting. The church still has many in use, for some reason the ballasts haven't blown up yet, but now are running F40 and F34 lamps. Maybe they tend to blow up on FM 28 lamps, not sure. Another example of solid-state electronics ruining a good product---mix them with a magnetic ballast and they even kill the magnetic ballast! Later! Rick D.
Colortone 50 is a Westinghouse "color"